Give Mom a Gift from Trudeau! Living in someone's else house while we are waiting for our house to sell is really taking a toll on our routines and general living. One of the ways I really notice it is in the kitchen. Almost all of my own kitchen accessories are in storage and sometimes I just feel lost in the kitchen with all my awesome kitchen accessories and tools! 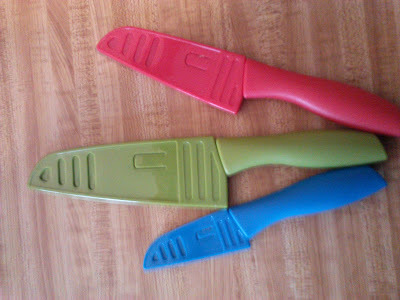 So when I received the A-MAZING Set of 3 Santoku Knives from Trudeau (Happy Early Mother's Day to ME! ), I felt like I was in heaven cutting things in the kitchen again! Trudeau's latest Santoku Knives are made from High Carbon Stainless Steel and feature a resin non-stick coating on blade to help keep food from sticking. I really love how great these knives cut and I love that they come with protective sheaths for safety from my two little ones! They are the perfect set for all types of chopping and cutting in the kitchen and it includes a Utility, Paring Mini and Classic knife. I also REALLY love Trudeau's Over-The-Sink Cutting Board. It really maximize's my working space and I LOVE how the strainer is removable to easily rinse and carry foods. It fits perfectly on our kitchen sink and it has become the cutting board I go to cut everything for every meal! 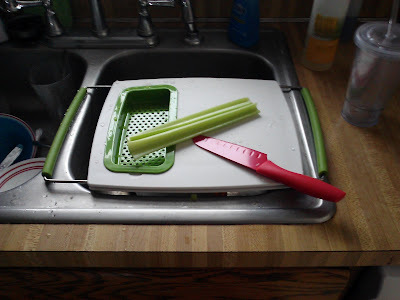 It keeps all the mess over the sink and it makes carrying the cut up food (or garbage parts) easy to carry wherever it needs to go! The third item from Trudeau that I don't know how I lived without is the Perfect Dressing Bottle. It's easy to make the perfect dressing with Trudeau's Perfect Dressing Bottle! Its simple to use: add ingredients shake and enjoy. It features a large dripless spout opening and 3 recipes printed on the bottle: Dijon Vinaigrette, Caesar Salad Dressing and Oriental Vinaigrette. The glass bottle with white finish is dishwasher safe. 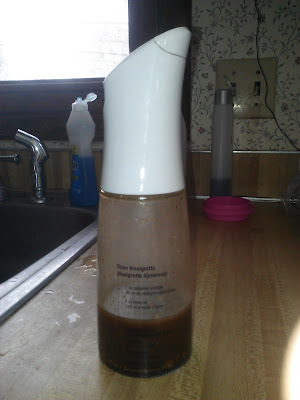 I have always wanted to make my own dressing but had no recipes or place to put the dressing when I made it. Now I have BOTH and I am in heaven every time I pour on the organic Dijon Vinaigrette on my salad and veggies that I made from scratch. It tastes AMAZING and I can thank this great Perfect Dressing Bottle and Trudeau for it! So this Mother's Day, make your mom very happy with some kitchen products from Trudeau! Whether she’s a gourmet goddess, budding barista, or always on the go, Trudeau has the perfect gift for every Mom this Mother’s Day. With affordable products in several categories including wine & bar, kitchen gadgets, mills & spices as well as mugs and bottles, the gifting options are endless. From automatic corkscrews and easy pour cocktail shakers to tea infusers and on the go mugs, there is truly a gift for every Mom in Trudeau’s extensive line of products. Buy It: You can purchase all Trudeau products online from Trudeau's website.